Ninety Rayong students were given a three-day lesson in marine ecology from the Royal Thai Navy and three area oil refineries. The June 19 Thai Sea Conservation Youth Camp at the Royal Thai Marine Corps battalion command center in Samae San saw students from four Rayong schools gain awareness of homeland and natural-resource conservation as well as an understanding of the eastern marine environment. 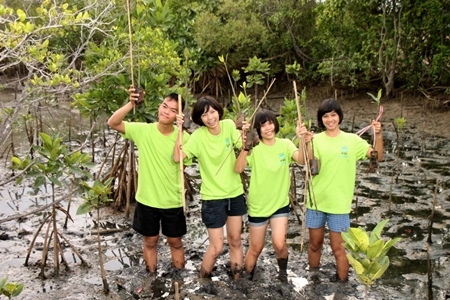 Students dig into the mud to plant mangrove shoots as part of their sea conservation camp. The camp, launched last July by the Royal Thai Navy and IRPC Public Co., this year gained the participation of PTT Aromatics and Refining Co and Star Petroleum Refining Co., as well as a Rayong committee on oil-leak prevention. IRPC President Pairin Chouchotthaworn said the camp was aimed at increasing cooperation on the environment between refinery employees, youth and local residents in Rayong. By giving kids more education, they can spread their knowledge to family members and schoolmates to create a better environment, he said. Vice Adm. Kanat Thongpool, commander of the 1st Naval Area Command, said the project also instills discipline, social awareness and the need for balance in coastal ecosystems.